With approximately 5,000 works, Berlin's Kupferstichkabinett houses the world's largest collection of drawings, watercolours, gouaches and prints by Karl Friedrich Schinkel. This unique collection not only encompasses works from all the artist's creative periods, but simultaneously documents the entire scope of his multifacetted artistic oeuvre. As an architect, Schinkel not only designed the exterior façade of buildings. He also worked on interiors, designing decorations, furnishings and artistic objects. He created both stage sets and independent, individual artworks. This immense diversity is also reflected in the materials and techniques used in the artworks which have been preserved to this day. These range from initial pencil studies and travel sketches, design drawings and tracings to watercolours and architectural plans designed with compass and pricker. 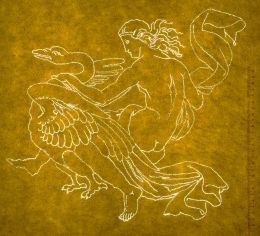 The collection offers a unique overview of the artistic techniques adopted by Schinkel and his preferred drawing materials and paper. The Schinkel project aimed to research this as yet neglected aspect of Schinkel's oeuvre and to systematically record the results in a publicly accessible database. 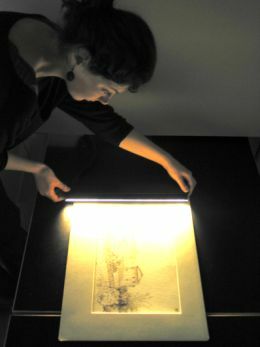 The non-destructive examination of drawing techniques and materials used in the Schinkel collection consisted of an initial, visual assessment of the art works and their the papers, from various light incidence angles (incident light, raking light, transmitted light). 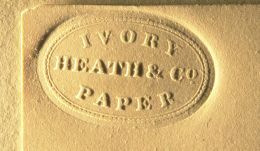 This technique allowed a precise identification and description of the papers . It furthermore allowed us to make statements regarding the structure, age, quality and origin of the paper. 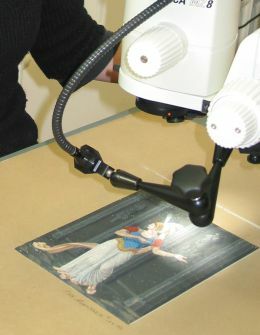 In order to obtain more detailed information, selected objects were further examined using a stereo-microscope and UV-radiation. The examination of the papers as well as drawing and painting materials was supported by scientific analyses. 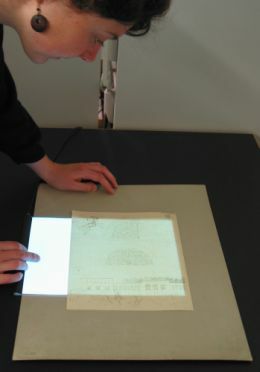 For example, watermarks were visualised and digitally recorded by the Fraunhofer Institute in Braunschweig using a newly developed thermography technique. Recording information related to artistic techniques and materials in a database facilitates the filtering of specific characteristics within larger object groups, their subsequent combination and their connection to one another and to information gained from art-historical research. The database attempts to answer complex questions, such as "Which drawing techniques did Schinkel apply during a specific creative period?" "Did he make distinctions regarding his choice of paper depending on the purpose and intention of a particular piece?" and "Where did he obtain materials during his study trips?"